President Muhammadu Buhari Tuesday in Abuja expressed appreciation for the important role the United States Government played in the success of the 2015 general elections in Nigeria. Receiving the outgoing Ambassador of the U.S, Mr James Entwistle, at the State House, President Buhari said the U.S insistence on free, fair and violent-free elections largely contributed to the deepening of democracy in the country. “The U.S support before, during and after the 2015 elections was vital to Nigeria’s stability and I will never forget the role they played in the stability of Nigeria. “We were lucky to have had an INEC Chairman who was competent and courageous. “Mr Ambassador, you occupied a position at a very strategic time in Nigeria’s history and I hope our historians will record this because it meant so much for our stability. “I hope you write a book on your experience in Nigeria. 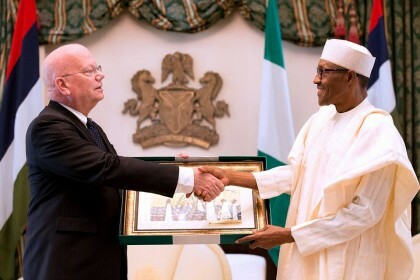 The commitment of U.S in supporting Nigeria has been unprecedented, ’’ the President told the outgoing U.S envoy. President Buhari also thanked the Americans for their military, intelligence and humanitarian support to Nigeria on the ongoing Boko Haram insurgency. He said Nigeria also valued U.S contributions to promoting regional peace and stability through the instrumentality of the G7. President Buhari also received in audience the outgoing High Commissioner of Canada to Nigeria, Ambassador Perry Calderwood. The President commended the Government of Canada’s humanitarian assistance to Nigerians displaced by the insurgency in the North East, and their commitment to polio eradication in the country. He highlighted the Federal Government’s effort to facilitate voluntary return of displaced persons in addition to ensuring that conditions in North-eastern Nigeria improve significantly before the next farming season. In their separate remarks, Ambassadors Entwistle and Calderwood had expressed concern on the deteriorating humanitarian situation in the North East with looming reports of food crisis and malnutrition. Entwistle said the bilateral relationship between both countries had remained very vibrant and cordial. “I had a marvellous three-and-half years in Nigeria and I am grateful to have been involved in the memorable elections in 2015,’’ he said. On his part, Calderwood conveyed Prime Minister Justin Trudeau’s desire to strengthen ties with Nigeria in Canada’s quest for partnership on international engagements, including its bid for a non-permanent seat in the UN Security Council, 2021-2022.